The American Family Community Garden expansion took a big step today, when GroundWorks broke new ground. 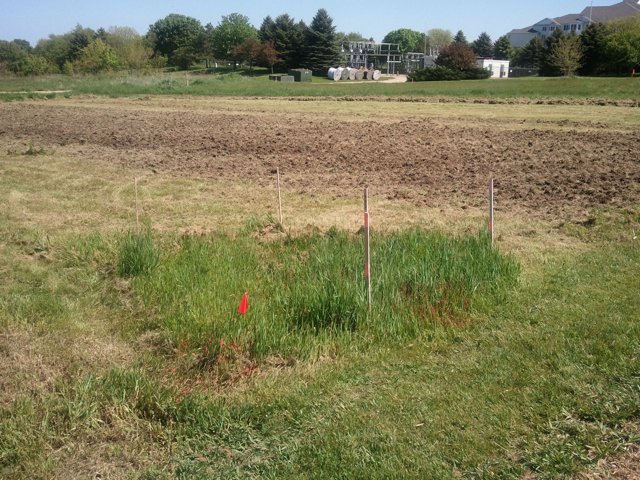 Below are photos of before and after tilling, and a brief movie of the tilling in action. Part of the expansion before tilling. The stakes are where a utility box will be installed later this spring. Half of this part of the expansion tilled. 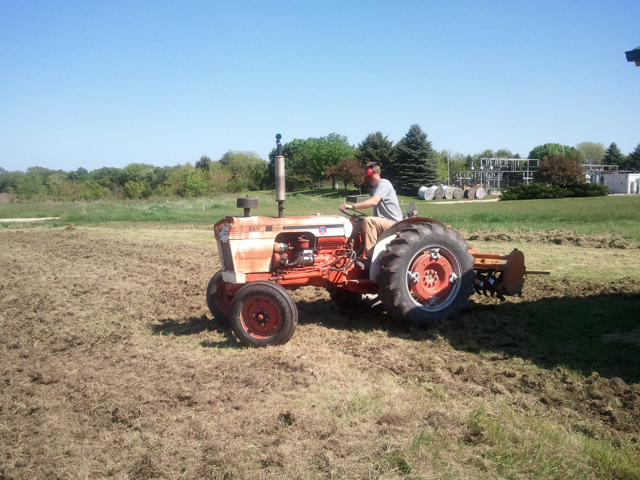 Jake from GroundWorks on an old but reliable tractor with a farm-sized roto-tiller on the back. 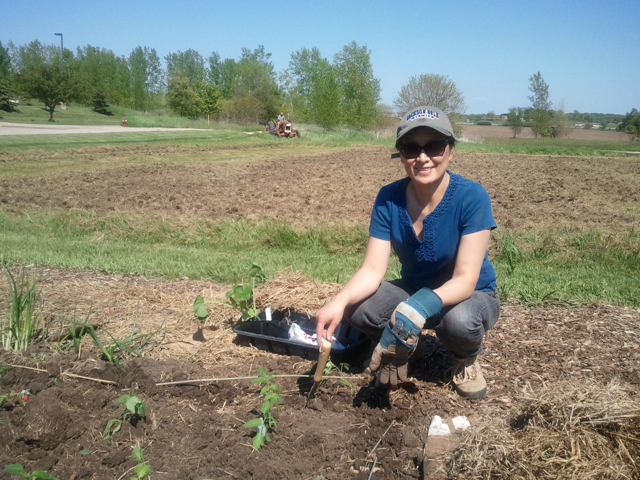 While the expansion was being tilled, one of last year's gardeners putting in plants and seeds. 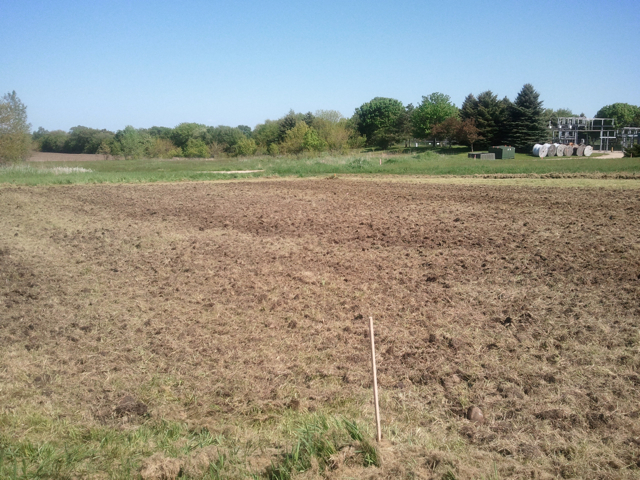 After tilling, the entire area is seeded with oats and then tilled again to work the seeds into the ground. 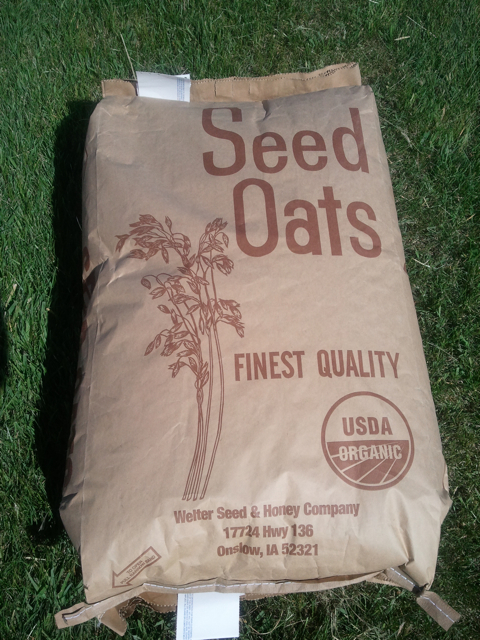 The oats will grow fast, crowding out weeds and providing a ground cover for several weeks. The ground will be tilled again just before being staked and plots are measured out. I went to this plant sale last year. Great variety of plants. But even if you aren't interested in the plant sale, it's a nice excuse to venture up to and explore this awesome co-housing development complete with gardens and a greenhouse. Complete plant list is here. All plants are certified organic. Plants will be arranged in the same order as they appear on the attached list - bring a copy of the list with you or pick one up at the event. All plants will also be well labeled. Plants will be in 4 or 6 packs and can be purchased as a pack, or packs can be cut for single plant sales. Scissors will be available at each table for cutting packs. 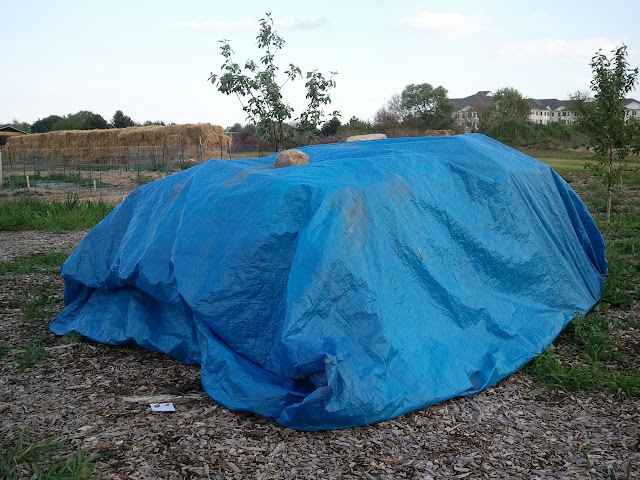 Additional gardening supplies available include our new planting calendar, organic cover crop seed, row cover, and compost. Volunteers will be available to answer questions and to help you get your purchases back to your vehicle. A box for carrying your plants home will be helpful. We will have some trays available for use while shopping. If you wish to purchase bulk compost ($2.00 per 5 gallon bucket), bring some buckets or other containers to carry the compost home. We will will also have pre-bagged compost available. I bought a soil test from Johanssen's Greenhouse (lusterleaf rapitest). Could have gone with the UW-Extension test, but I didn't feel like taking the time, and for the same price, I get 10 tests with the do-it-yourself kind. The main reason I wanted to test my soil is that I read that onions prefer a slightly acidic soil of pH 6.0-7.0). My soil, which is actually a combo of soil and compost, tested at 7.0 or higher, probably north of neutral. 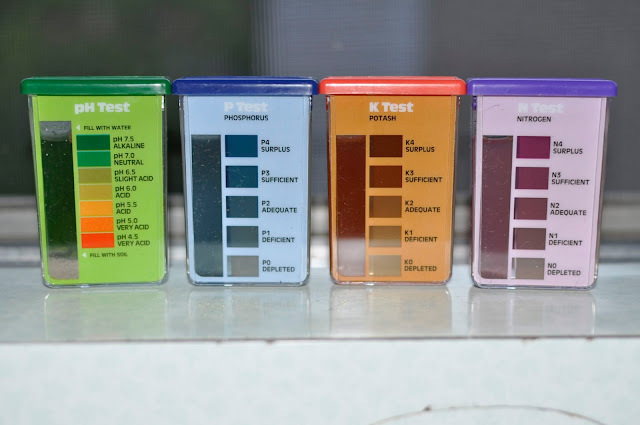 The test told me about all the ways I could amend the soil to acidify it by adding iron or aluminum sulfate. But I also want to, within the constraints of my small garden, rotate crops. So one year's onion patch may be next years tomatos, which can tolerate 5.5 - 7.5 or eggplant (5.0-6.0) or peppers (6.0-8.0). Actually, now that I look at my favorite veggies, all of them prefer a bit more acidic soil. Maybe it is time to amend. 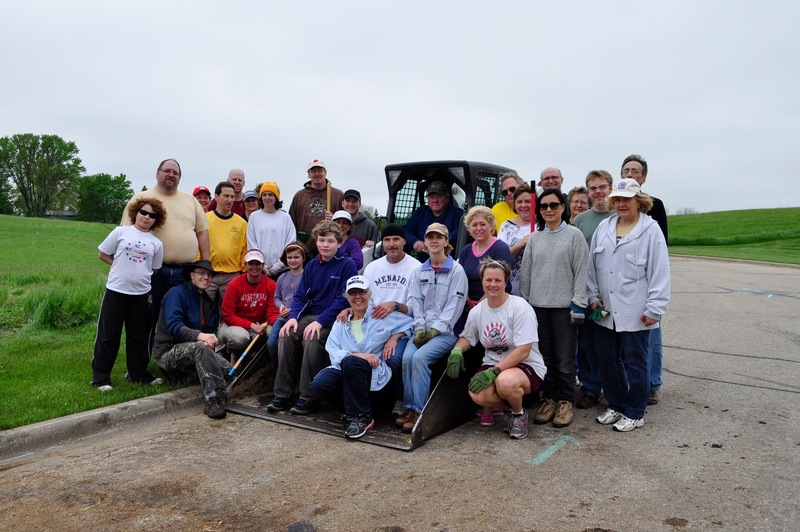 I couldn't be more proud of the American Family community gardeners. In early April, 25 new and current gardeners showed up to move piles of wood mulch and compost to make room for the expansion. In early May, more than 30 people showed up to lay down cardboard and spread 30 cubic yards of wood mulch throughout the garden paths and orchard. And we did it in under an hour. That's cardboard laid down and a cubic yard of mulch loaded, moved, unloaded and spread every two minutes! Our secret? You're going to have to watch the video to see how we did it! HINT: it warms the heart of this guy who was raised on a farm! Nice job gardeners. Nice job indeed. 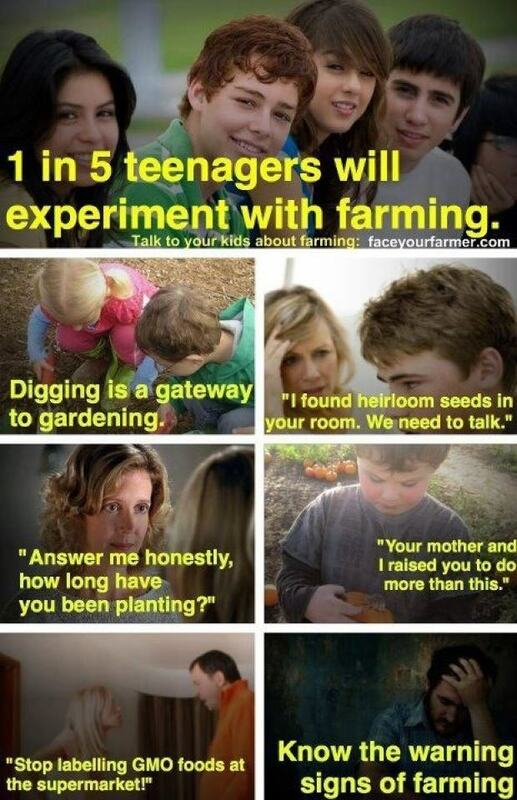 It's been a big week in the American Family Community Garden. Check out the photos. 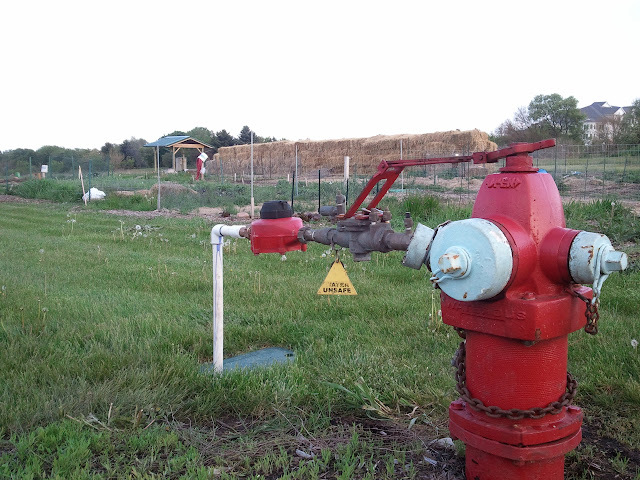 The water supply was hooked up. Terri and Peg have gathered a huge pile of cardboard for our May 5 path workday. 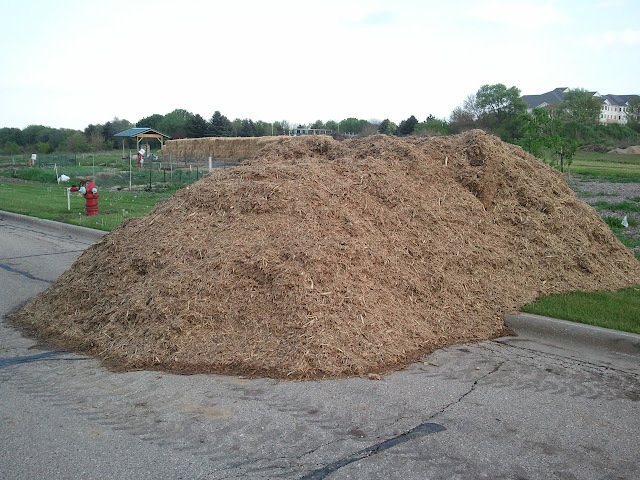 Angela watched in horror as one half of 30 cubic yards of mulch missed the mark and spilled out onto the paved road. We'll have it all moved by Saturday afternoon, promise! 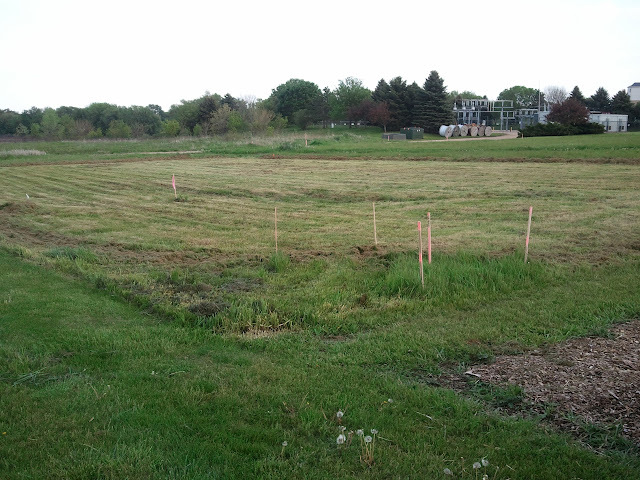 AmFam grounds super-guy Zach mowed the grass super short in the expansion area anticipating Madison GroundWorks arrival next week to plow and plant an oat cover crop!